There are thousands of network and Wi-Fi apps in the store that makes us go gaga before using them, but as soon as we get our hands on them, they quickly succeed to disappoint us. But the one I’ve discovered recently would be the best network analyzer and monitoring software, and apart from being a powerful app, it does exactly what it means to. 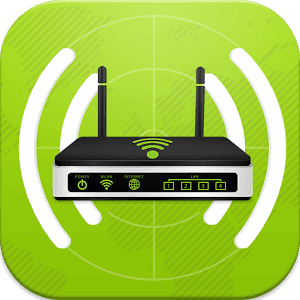 The app’s name is Home Wifi Alert -WiFi Analyser and it is a pretty simple but smart app with dozens of network related tools for home connection and much more. So without any further talking, let’s start the review of this exceptionally remarkable application. As the name suggests, Wifi Analyzer lets you monitor and analyze your home, personal or any other network for various security reasons and enhancements. It packs dozens of essential system tools which keeps you informed with of your Wi-Fi connection, the number of devices connected, and what’s connected to it, and every detail for the network speeds, connection strength, and much more. Whether you want to enhance your connection or speed up your network speed with all the premium features, WiFi analyzer is always here for you. So, let’s dip into all the amazing features that it offers for the users. Before you crave to monitor and evaluate your network details, you’ll need to download the WiFi Analyzer app from the Play Store. The app is free and support devices with Android 4.0.3 and up. With over half million downloads, this app is pretty great and offers various features that you can rely on. After the installation, the app greets you with a homepage containing all the necessary features that you the app provides. The first thing you need is to scan for all the networks, and the app automatically displays the relevant information related to the network. 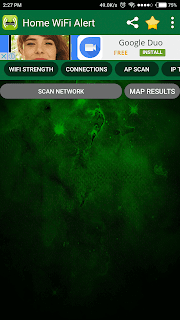 Also, the app has inbuilt IP tools, augmented flow graphs and strengths of the networks according to the application. The scanning process only takes few seconds, and you’re all ready to rock. You can also monitor all the latest activities in your network, and how many devices are connected to it. Frankly speaking, the app offers more than you can expect from a free version. The AP (Articulation Points) graph is very useful when you need to scan and verify the speed of your network connection. 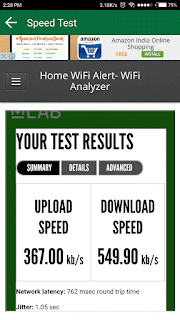 The app is compatible to test out the speed for both 2.4Ghz and 5Ghz networks. The interface is very plain and looks more of an informative open source application. It is crafted in such a way that it could be used by anyone, from a simple user to a network administrator. The menu has other options which contain about and help sections for the users. Integrated Speed Test allows you to check the network speed. So, you don’t need to install other apps such as OOKLA Speed test. You can also view the Mac Address, IP Addresses and the number of devices connected to the network. Moreover, if you’re concerned with enhancing the speed of your system, then the app allows you to view the surrounding networks and the channels. The app will also display surrounding networks and the channels that they’re sending out signals on. So, you can easily choose the best channel on which your network could work on. It is fairly an excellent way of increasing the speed. The thing I liked the most about the app is the block feature. It often comes in handy when you need to stop a device from using your network to access the internet. 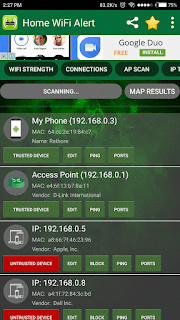 You can quickly detect the device which is using your network. It is mainly for the networks which have weak passwords. Otherwise, you can also change your network key. The tool is free to use but contains ads as a source of revenue, and everyone knows how irritating these ads are on your smartphones, popping at weird times. Nonetheless, you can purchase the pro version of Wifi Analyzer for a price of $0.99. Dozens of Network Tools like AP Scan and Graph. Simple UI & Fast Access to Features. Block Devices from the app. Sometimes during the scanning process, the app tends to crash on my Tablet, but I presume that’s the device problem. So, please let me know if you’re having such trouble or not. Wifi Analyzer – Home Wifi Alert is a beastly version of typical network scanner and analyzer. You can use all the offered features to increase the speed of your connection. So, if you have a home network connection, then this is a good app to gain the full control over your network. Cheers!